A 10 oz. Gift Box of our All Natural Chocolate Straws. Belgian Chocolate wrapped in a thin layer of hard candy with no artificial ingredients. 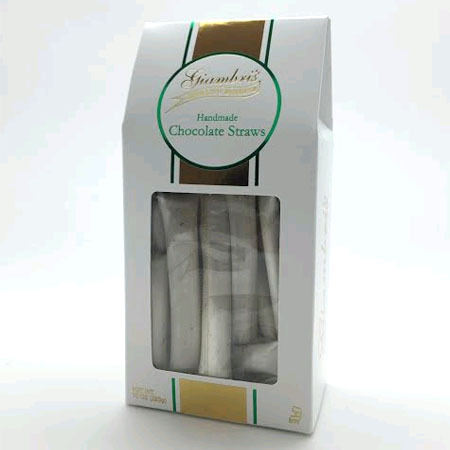 Giambri's Chocolate straws have a delicate candy shell that invites munching or savoring slowly. The chocolate interior is dark enough for adult taste and sweet enough to please a child. 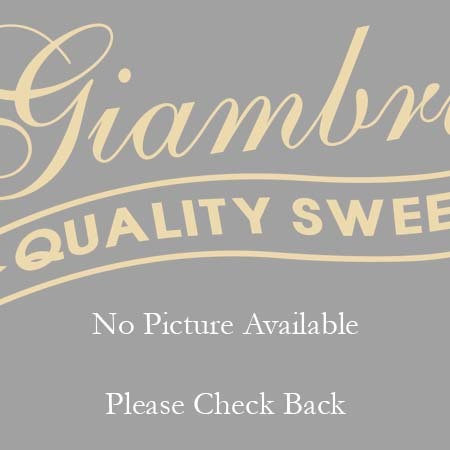 This beautiful old-fashioned candy is nearly impossible to find, and no commercial product comes remotely close to the quality of Giambri's Chocolate Straws. My love for Chocolate Straws goes back to childhood and summers at the Jersey shore, with thanks to a family friend who inherited his grandfather's candy store (founded in 1886) in Cape May. When that store closed, my sister and I went on a serious hunt to find Chocolate Straws of a similar delicacy and deliciousness...and it was an impossible task. UNTIL I found Giambri's. Thank you for keeping this delicious old-fashioned treat alive! Scrumptious chocolate straws. Incredible cocoa flavor. I bought 2 packages to serve at a family party. I plan to order more in the future Only wish there were free shipping... (but they are worth every penny. Thank you. I have ordered the all natural gourmet chocolate straws 3 times. They are wonderful. Lots of chocolate in the center. Much better than the chocolate straws I enjoyed as a child. 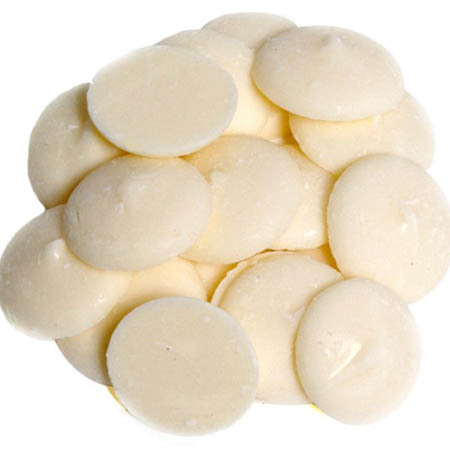 Giambri makes a high quality delicious product and it is packed with care! Chocolate straws - hand-made - have been a long-standing tradition in my family for generations. Our dear friend George Roth inherited Roth's Candyland from his grandfather in the 1940's, and one of their finest confections was the chocolate straw. Simple, but finicky. You can't make them when it is too humid. The delicate thin straws are the most divine, but thick straws travel better. We watched them being made - what a special treat it was to be invited to the back of the store to see the magic take place! Everyone in my family loved them. My college pals still remember candy from George, and particularly the chocolate straws. But George passed away several years ago, and the store closed a few years later in spite of the efforts of his family to keep it going. A couple of years ago my sister and I, unbeknownst to each other, decided to find the best chocolate straws being made. We (separately) visited small town candy stores, combed the internet and asked around. I am in LA, she is on the east coast. That Christmas we sent each other the best of our efforts. We had big laughs when we discovered we were both up to the same thing! The winner - hands down - was and is Giambri's chocolate straws. the flavor and hand-wrought care come through in every bite. 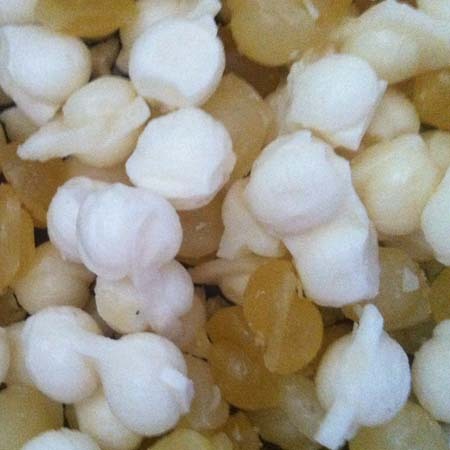 My west coast friends have never tasted anything like them, and love them. I have shared the word with cousins who have told me their own chocolate straw stories, and are ordering from Giambri's. This divine little treat brings us the sweetest memories of our times in south jersey, and fires up delicious nearly forgotten stories. Thank you for keeping the old-fashioned candy-making traditions alive! Liquor chocolate, sugar, water, corn syrup, cream of tartar.